One town, one Halloween night, 10 stories intersect to tell the tales that make up an array of stories related to the holiday. From creatures to witches and slashers to troublesome trick or treaters there is something for every horror fan to enjoy in Tales Of Halloween. Some of the highlights include the segment “Sweet Tooth,” a creepy tale about not hogging all of the candy. “This Means War” is a fun take on rival home haunters, while “Friday The 31st” is a grand gory slasher spoof. But those were just my favorites; there are seven more stories crammed into a fast-paced hour and a half so there is bound to be something for everyone’s tastes. While there is some minor fluctuation in the quality of each story involved, the overall movie is extremely entertaining and has a great balance of both scares and laughs. The film maintains a great cohesive feeling and visual style even though seven different cinematographers shot the movie, which is a credit to the producers who oversaw the project. Tales Of Halloween benefits from the involvement of both genre veterans and up-and-comers in front of and behind the camera. With segments directed by Neil Marshall (The Descent), Lucky Mckee (May), Darren Lynn Bousman (Repo: A Genetic Opera), and Paul Solet (Dark Summer) among others we are also treated to a wealth of recognizable filmmakers and actors who appear in the film such as Adrienne Barbeau, Lin Shaye, Barry Bostwick, Barbara Crampton, John Landis, Joe Dante, and Adam Green plus many many more. I can’t recommend Tales Of Halloween enough for horror fans and people looking for a fun film to watch for Halloween. I feel confident in stating that I believe Tales Of Halloween will become a seasonal regular alongside Halloween (1978) and Trick ’r Treat (2007), not only for me but for legions of horror fans. 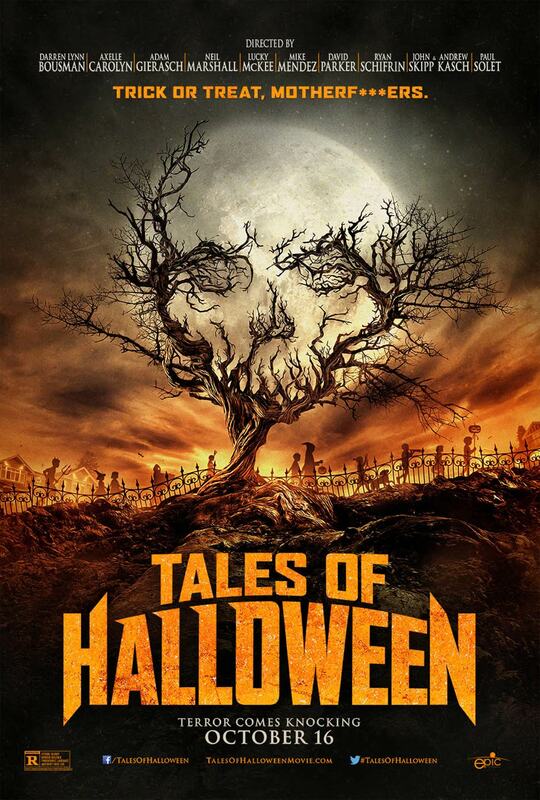 Check out Tales Of Halloween now on all VOD platforms. Tales Of Halloween (2015); Directors: Darren Lynn Bousman, Axelle Carolyn, Adam Gierasch, Andrew Kasch, Neil Marshall, Lucky McKee, Mike Mendez, Dave Parker, Ryan Schifrin, John Skipp, and Paul Solet; Starring: Way too many people to list. Previous post: Alt-Nation: Consuelo’s Revenge and The Viennagram — This Weekend!